Vintage Belt Buckle " Polish Armed Guard Marksman of the Year" with Backwards Gun! Home > Men's Accessories > Vintage Belts / Buckles > Vintage Belt Buckle " Polish Armed Guard Marksman of the Year" with Backwards Gun! 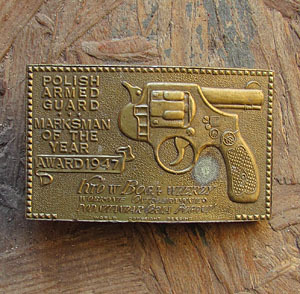 Vintage Belt Buckle, Text says "Polish Armed Guard, Marksman of the Year Award 1967" on the left side with a Wonky Gun that has a backwards facing barrel on the other side. Hilariously Offensive! Has something in Polish across the bottom. Lighter Brassy Finish.